Nothing beats a fresh tomato straight from the garden. Maybe that’s why it is so disappointing when you are ready to harvest a few, only to find some critters have beat you to the prize. 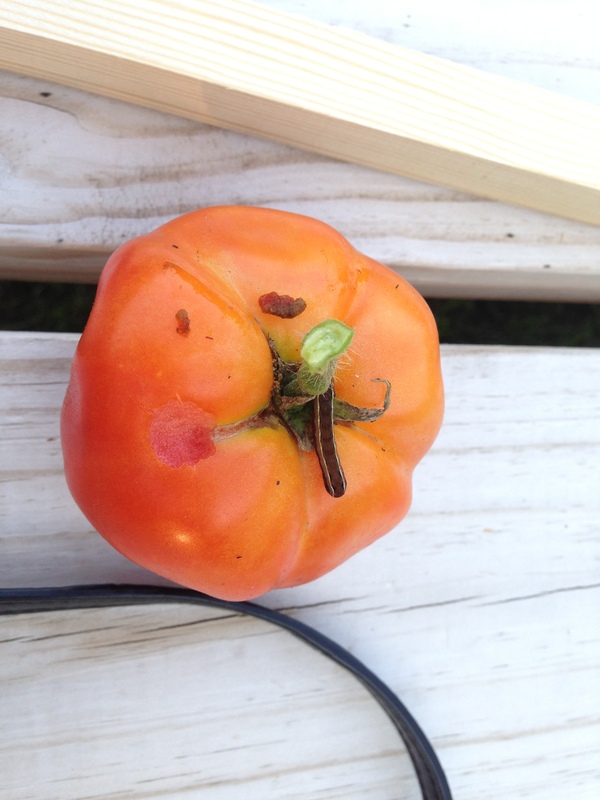 The tomato fruitworm, shown below, is one pest that you may be seeing in your garden now. Also known as the corn earworm or cotton bollworm, these larvae of the Helicoverpa zea moth enter tomato fruits near the stem end, feeding on the fruit and providing an entry point for decay-causing microorganisms. This pest can also damage leaves and stems of tomato plants, as well as peppers, beans, corn, broccoli, cabbage, okra, soybeans, and tobacco. The H. zea moth is “usually light yellowish-olive with a single dark spot near the center of each forewing. It lays eggs singly, usually on the lower sides of leaflets close to the flower or fruits. The eggs are creamy white when laid but develop a reddish-brown band just prior to hatching. Larvae (caterpillars) hatch from the eggs. The larvae are yellowish-white with a brown head. The color of older larvae varies from greenish-yellow to brown or even black with paler stripes running lengthwise on the body. Larvae grow to a size of about 1½ inches in length”. (per Clemson University HGIC 2218) Fruitworms overwinter in soil and emerge in May – June. Moths are commonly seen at night during summer and early fall. Bacillus thuringiensis (B.t.) products are the recommended control for fruitworms in the home garden.